Do you want a Giant 10 foot movie theater experience but don't have the empty wall space that is typically needed? Then this is the Projector Screen you need. You can hang this screen in front of your furnishings and move it from room to room in just seconds! No need to go out and buy additional materials to build a custom frame. This is a COMPLETE KIT with nothing extra to buy or build. Great for kids too! The Wrinkle Free feature means they can take it down and throw it in a drawer until it's needed again. Made in the USA! Special 4-way stretch "Brilliant Display" spandex / lycra material is specially designed for BOTH front & rear projection capability. Guaranteed best choice with 100% guarantee. Don't be fooled by cheap imitations made in China. Don't skimp on your home theater cinema experience. More lightweight and portable than ceiling mount pull down screens. No permanent fixed frame wall space required like Blackout cloth or Goo Paint. Quicker and easier than airblown inflatable screens which require 2 people to set up, noisy fan during the movie & are too big to use indoors. 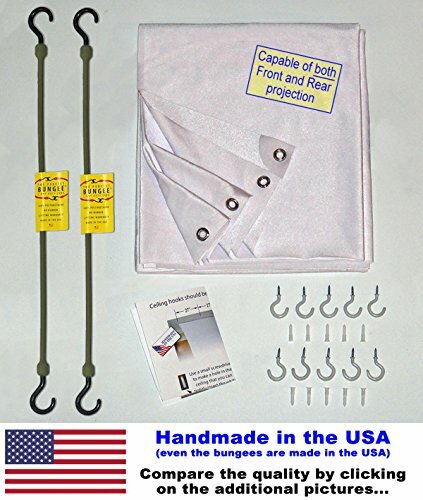 Our screen kit: Just screw 5 nearly invisible hooks into your ceiling and put your screen up in 30 seconds. No tripod stand needed for indoor use. If you have any questions about this product by StretchScreenUSA, contact us by completing and submitting the form below. If you are looking for a specif part number, please include it with your message.